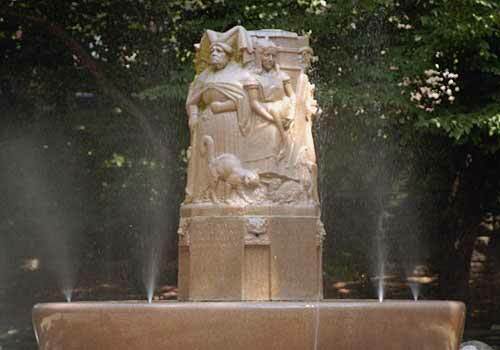 Originally a drinking fountain dedicated to Ms. Loeb, a writer and social advocate for children, this sculpture stood outside Heckscher Playground. In 1987 it was moved by the Central Park Conservancy to the Levin Playground and refitted as a water play feature. Most visitors are surprised to learn that only a short walk north from the Alice in Wonderland statue by Jose de Creeft at Conservatory Water stands another sculpture featuring Lewis Carroll's famous characters: Alice, the Queen, the Duchess, the Cheshire Cat, the Griffon and the White Rabbit. East Side at Fith Avenue and 77th Street in the James Michael Levin Playground.